This painting depicts Jesus as a student at the age of twelve. 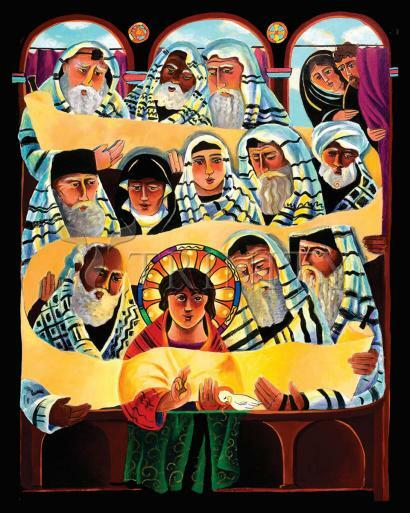 According to the gospel of Luke, He sat amidst the teachers in the Temple in Jerusalem, asking them questions and astounding them with His answers and the breadth of His knowledge. In the upper right corner, we see the tear-stained faces of Mary and Joseph, who have spent three days frantically looking for Him among the throngs of people who had come there for Passover. Their tears are the tears of relief and pride. The elders of the Temple are shown not just as Rabbis, but also represent leaders and teachers from other faiths and cultures. They are all dressed in black and white to emphasize Jesus as the only source of color and light. He inspires us to think outside the boundaries of our black and white worlds, and to find in Him the encouragement we need to be ourselves, broaden our horizons, and deepen the faith that lives in our hearts. Following His example, we become students for life in “our father’s house”, always ready to learn something new about ourselves and about the love of God. 39 When they had finished everything required by the law of the Lord, they returned to Galilee, to their own town of Nazareth.40The child grew and became strong, filled with wisdom; and the favor of God was upon him. 41 Now every year his parents went to Jerusalem for the festival of the Passover.42And when he was twelve years old, they went up as usual for the festival.43When the festival was ended and they started to return, the boy Jesus stayed behind in Jerusalem, but his parents did not know it.44Assuming that he was in the group of travelers, they went a day's journey. Then they started to look for him among their relatives and friends. 45When they did not find him, they returned to Jerusalem to search for him.46After three days they found him in the temple, sitting among the teachers, listening to them and asking them questions.47And all who heard him were amazed at his understanding and his answers.48When his parents saw him they were astonished; and his mother said to him, "Child, why have you treated us like this? Look, your father and I have been searching for you in great anxiety." 49He said to them, "Why were you searching for me? Did you not know that I must be in my Father's house? "50But they did not understand what he said to them.51Then he went down with them and came to Nazareth, and was obedient to them. His mother treasured all these things in her heart.